Tonight I thought I’d try a new writing challenge. Chuck Wendig, author, screenwriter, game designer, and blogger extraordinaire, hosts a weekly writing challenge. You can find his post and his blog, “terribleminds: chuck wendig” here. This week, he provides two columns of words. The challenge is to pick a word from column one, then pick a word from column two, and that’s your title for a 1000 word post due this Friday. That sounds like fun, I think, as I peruse the words. The words are a little out there, but hey, I can come up with something! Mr. Wendig suggests rolling dice to pick your title. I ask my husband, Joe (busy cursing at the Jets) to pick two numbers between 1 and 10 (finding dice in this house would be a challenge in and of itself). He picks 3 and 4, making my title: REMOTE CONTROL HIVE-MIND. Hmm, I think. I should be able to come up with SOMETHING. Then I get distracted by another definition on Urban Dictionary, “An enormous, single, intelligent entity made up of many smaller minds.” What does this definition bring to mind, people? If you are anything like me, you think of Congress. Stupid Congress shutting down the government! Maybe “intelligent” wouldn’t be part of the hive-mind definition for our government. Congress is like two little political party hive-minds running the country. After my minor Congressional detour (and a Jets touchdown! ), I try to empty my mind and create my scintillating “Remote Control Hive-Mind” story. Where to go with this? Maybe a group like Congress (the hive-mind) controlled (remotely) by an evil dictator? Maybe I can switch the words around and have a hive-mind remote control? Would that even make a difference for storytelling purposes? The couch vibrates. Yay! Saved by the bell. I check my texts. It’s a Scandal related text from my friend, Nicole, who’s Netflix binge-watching Seasons One and Two to catch up. Woo-Hoo! Scandal talk! 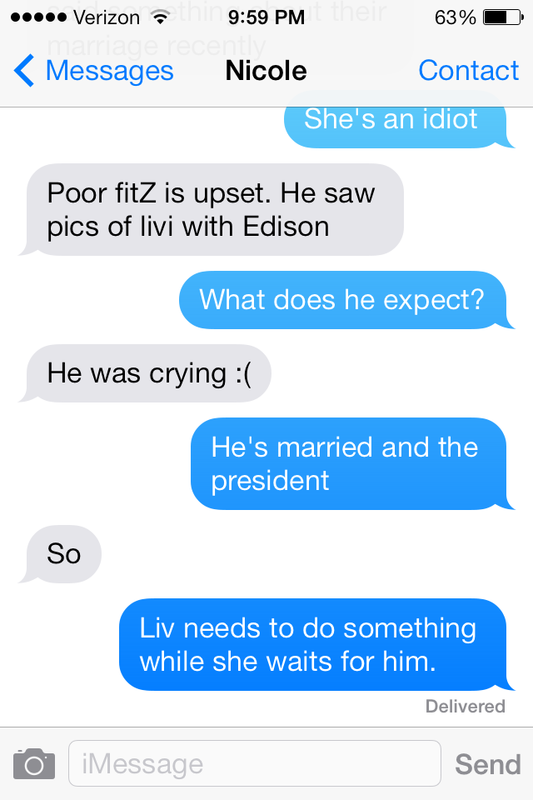 We chat about Liv and Fitz. Huck. Duck hunting. How Nicole’s mom hates Fitz and the reasons we love him. The annoyingness of Abby, the yuckiness of Edison. Just then, Joe cheers disrupting my texting. Wait? ANOTHER Jets touchdown? They’re actually playing well? It’s a Monday Night Miracle! I check the phone. No more Scandal texts. Either Nicole’s dealing with the kids, or she’s hiding in the closet with her iPad and earbuds engrossed in our favorite ABC drama. I fidget. Why are my legs hot? Oh yeah, my laptop is sitting on them! I’m posting. What am I posting again? Back to the Remote Control Hive-Mind– the BEST story never written! Mr. Wendig’s going to be SO impressed with my story, I think, as I wiggle my fingers. Did I mention that my brother and sister-in-law had a baby today? A beautiful baby girl. He sent me pictures and I decide that I can’t go on without studying her little face again. I pull up the pictures on the phone. Gosh she’s cute. She may resemble me . . . Husband Joe makes a noise. I check the television. It’s the Jets. Doing good things! You know, it’s not really fair that these Monday Night Football games are on so late. Why do we have to cater to the West Coast all the time when it comes to sports? We have to go to work too. Eight-thirty is way too late for a football game to start on a school night. The West Coast probably doesn’t even care about the Jets and the Falcons. Couldn’t we start an hour earlier? Halftime! Husband Joe is talking a lot in regular tones, normal volume. I wonder if I’m supposed to be listening . . . I sigh and wave the white flag. I got nothing. The distractions are overpowering and way too entertaining. Sorry, Mr. Wendig. Sorry, Blogtropolis. I just can’t tonight. I think I’ll dig up a pair of dice and roll for a new title. Maybe try before Friday’s deadline. Please, if anyone has any ideas for Remote Control Hive-Minds, or if you try the challenge yourself, let me know! Tonight is not a writing night for me. (Hmm, I did just complete a post though). Awesome 🙂 I totally agree with you about Monday night football starting time. hahahahaha – that was greatness! My mind has a tendency to work like that, too! Cracked me up! Pingback: Review: The Cormorant by Chuck Wendig | Hey Sweetheart, Get Me Rewrite!